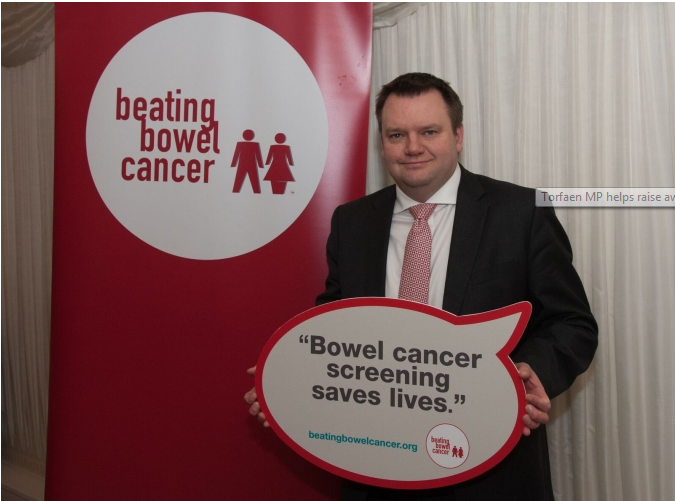 I was delighted to convene a debate in Parliament on the importance of bowel cancer screening programmes across the UK. The debate gave members of parliament from across the political divide and the devolved nations an opportunity to discuss vital improvements to screening and raise concerns on behalf of their constituents. It also gave the Minister for Cancer, Steve Brine MP, an opportunity to respond to the questions in the debate. We all know how important an early diagnosis is, as nearly everyone will survive bowel cancer if diagnosed at the earliest stage. Yet bowel cancer is the fourth most common cancer in the UK and the second biggest killer. Sadly, around 16,000 people die from the disease each year. I lost my beloved mother, Pam, to bowel cancer on New Year’s Day. My wonderful mother lived just under two years after her late-stage diagnosis. I know only too well the impact that bowel cancer has on families, supporting her through three tough rounds of chemotherapy, and helping to achieve her goal of living long enough to meet her grandson, my son William. Due to the care and treatment she received, her inspirational bravery and sheer determination, she lived to see him reach his first birthday, and to see her beloved granddaughters Matilda and Florence reach the ages of 8 and 5: precious moments that are now my precious memories. During this debate, many MPs shared personal stories of family members diagnosed with bowel cancer. It was very hard to talk about the loss of my beloved mother, so I want to thank all my colleagues for their support and for contributing to a very positive discussion during this debate. It is clear that taking part in screening is the best way to detect cancer at this vital early stage. I secured this debate to highlight the importance of participation and to push for essential improvements to the screening programme. The screening programme currently uses the guaiac faecal occult blood test (gFOBT) in home test kits for all men and women between the ages of 60 and 74. Now, the best available test – which can detect more cancers – is the faecal immunochemical test (FIT). This more accurate and easy to use test has been proven to increase participation and detect more cancers. A major advantage of the new test is that the cut-off level, or sensitivity, for detecting blood in poo can be adjusted to make it a more or less accurate at detecting bowel cancer and to determine the number of people who will be referred for a colonoscopy. So, a highly sensitive FIT will require many more people to have a colonoscopy and services are already struggling to cope with current demand. Scotland is already screening using the FIT test from the age of 50. The Welsh Government is introducing the FIT test from March 2019. I hope that there will be a decision for Northern Ireland soon. One of the great advantages of devolution is to share best practice right across the UK. There are two key issues that must be addressed to ensure the success of the roll out of the new screening test. First, we need high-quality endoscopy capacity to deal with the increased numbers of people that will be referred on for further investigation, as the test is more accurate and sensitive to blood in poo many more people will be referred for a diagnostic test. Secondly, pathology capacity must be increased in order to deal with the increase in the number of specimens that will need to be examined. As a priority the UK Health Ministers must work with health bodies to assess what extra endoscopy and pathology staff are required for FIT to be introduced and how the sensitivity can be improved over time. A plan must be designed and executed as matter of urgency. Saving lives and giving more families more precious moments with their loved ones should be the only incentive we need to make progress. As a Bowel Cancer Champion, I will continue to raise this in parliament and make sure this stays on the political agenda with the support of Bowel Cancer UK and Beating Bowel Cancer. Find out if your MP is a bowel cancer champion and help make sure wherever you live, bowel cancer screening detects cancer at its earliest stage and saves many more lives. Find out more about why Bowel Cancer UK and Beating Bowel Cancer are working to introduce vital improvements to the bowel cancer screening programme. Share your story. Personal stories help us highlight the experience of people affected by bowel cancer with key decision makers. The stories can be used in the media, on their website, on their social media and in their materials.